Can you rely on God too much? Is religion really a crutch? After a conversation with somebody today that professes to be a Christian about politics, I couldn’t get the thought out of my head that we rely on God too much. We are always taught to bring every little thing to God, his eye is on the sparrow and we know that he watches us, and that he knows every need before we ask. While not disputing these Biblical truths, I do have to make the statement that religion can be a crutch to many people. A crutch is simply a device used to uplift people in times of brokenness and weakness. 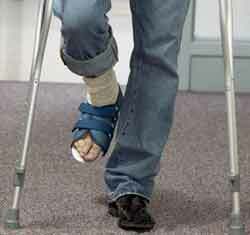 If you sprain your ankle and it is weak, you turn to a crutch to aid you in your mobility. Oftentimes though, you can get used to walking on this crutch and you no longer desire to walk on your own. God gave everyone of us gifts to use in his kingdom and a mind to use in our own everyday choices and decisions. This person I was talking to about politics stated that she isn’t going to vote but she is really praying for the hand of God in the election. Is it fair to rely on God to pick the right president when we aren’t even willing to put legs to our prayer and do our part to vote? Is it fair to blame God when we pray about things and then do nothing to help bring our prayers into fruition? For example, can we complain to God about our financial situation if we aren’t willing to get a job, transfer jobs, or budget? The book of Philippians talks about being anxious for nothing but to let our requests be made known unto God with prayer and supplication. Just a little bit down in the same chapter it talks about being content in whatsoever state that we are in. Whether we want or are full, we are to be content. With this thought in mind, is it fair for me to use the church and the mysterious “will of God” as an excuse to not succeed? Could I just be saying that something is or isn’t the will of God to fit into my own personal paradigm? Is this just an excuse for me to have to do nothing to help myself? I can pray every day to lose weight and then consume 2 gallons of ice cream on top of my prayer. I can pray for health and well being and then refuse to receive preventative care at the Doctor and follow basic medical laws. The goodness and mercy of God is not an excuse or a crutch for Christians. If anything, it should be the reason that we desire to better ourselves. We should desire education, greatness, and success. This all brings glory to God. God doesn’t desire for his people to walk with a spiritual limp and a God crutch under their arm. God also wants his people to rely on him, call on him, and seek him for things that require a God intervention. If God has already given you the tools to accomplish a task, do it and do it well. Don’t wait for God to provide the miraculous for a situation that you can do on your own. Find something to do with your life. Do seek God in decisions, but search for things on your own. This passage of scripture speaks of hard work and diligence. Of course earthly pursuits are secondary to the work of God and will of God, but they are still something that are required to survive in the 21st century. Ruth chapter 2 talks about God rewarding your work and making your wages full. God will help those that help themselves.